I give you - Pictures! 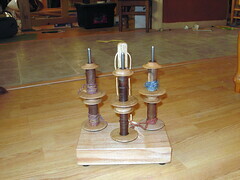 Here's a picture of the flyer and bobbin array, with my "favorite" bobbin. The whorl size is 1 3/16. This is the bobbin rack Alden made me. As you can see, it holds 6 bobbins. 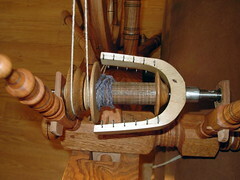 A closeup of the flax bobbin. The ridge is there to keep the flax from sliding around, if I remember correctly. I need to ask Stephenie again. 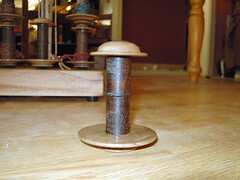 I have 2 flax bobbins, 1 silk bobbin, 1 bobbin that's "identical" to my favorite, and 2 others. The whorl sizes are totally different from what I already had - I need to sit down and figure the ratios and all, but yea! I have 9 bobbins for my Norwegian wheel!! I need to sit down and play with them...but I'm 1/2 done with Christmas present #3, and I want to get it DONE. Friday has been slated "get to know the new bobbins" day. Awesome, thanks for posting the pics. Isn't it fun to play with our new toys? I have a short spring break this year but I plan on spending most of it with my new wheel.